Petition Stop all U.S. Elephant Trophy Hunting Imports; limit the number of elephant sport-hunted trophies from 2 to ZERO, per hunter, per year. Stop all U.S. Elephant Trophy Hunting Imports; limit the number of elephant sport-hunted trophies from 2 to ZERO, per hunter, per year. There is no difference between Ivory Poaching & Trophy Hunting elephants; killing elephants is killing elephants. Given the current statistics on elephant population declines, an elephant is killed every 15 minutes. At this rate elephants are expected to be extinct in 10-11 years. Trophy Hunting Elephants is contributing to this slaughter. The U.S. National Strategy for Combating Wildlife Trafficking & Commercial Ban on Trade in Elephant Ivory limits the number of African elephant sport-hunted trophies that an individual can import to 2 per hunter, per year. This is a contradictory loophole in the U.S. National Strategy for Combating Wildlife Trafficking & Commercial Ban on Trade in Elephant Ivory! To ban "commercial" elephant imports and then to allow trophy hunted "personal" imports is contradictory to making positive efforts to save this species. The trophy hunting industry is alive and well. 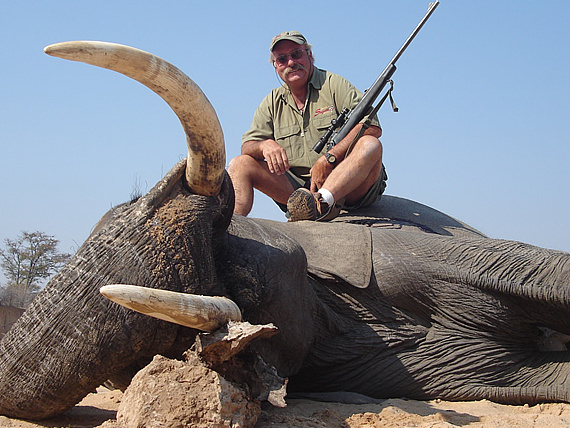 The Safari Club International is aggressively defending "their right" to trophy hunt elephants. The SCI is currently involved or has recently been involved in the following cases: Elephant Importation Ban (SCI v. Jewell ), and the Elephant Importation Ban Freedom of Information Act Request (SCI v. FWS) ... The SCI will be filing a new lawsuit to challenge the FWS’s decision to continue Zimbabwe’s importation ban for 2015 and into the future. Many trophy hunting companies are also defending "their right" to kill elephants. For example, Comre Safaris has recently stated "Go ahead and kill the elephants. And rhinos and tigers and all the rest of your favorite Lion King animals. It might be their best hope for avoiding extinction." They also stated ".... In other words, to save the animals, people should be allowed to kill them." Allowing 2 elephant trophy hunted imports per hunter per year is contributing to the species extinction and also supporting this mentality. Please stop ALL U.S. Elephant Trophy Hunting Imports; limit the number of African elephant sport-hunted trophies that an individual can import from 2 to ZERO, per hunter, per year. Sending this petition to Barack Obama, the U.S. Fish & Wildlife Service, Sally Jewell, & ESA. Thank you for signing and sharing! !